It is believed that seals probably evolved from otter-like ancestors about 15 – 20 million years ago. They are shaped like ‘torpedoes’, with no obvious neck, no external ears or genitalia and reduced limbs and tail. This helps to reduce drag in the water which is 800 times denser than air. The streamlining is enhanced by the layer of blubber rounding off all boney protruberances. Seals are warm blooded. The loss of appendages allows them to conserve more heat due to their low surface area : volume ratio. Heat is lost from all parts of the body that are in contact with the water. Blubber provides insulation in water, which has a thermal conductivity 25 times that of air. Seals are extremely agile in the water. The hind limbs provide mechanical motion from the rear end with powerful sideward thrusts. They can achieve speeds of up to 25 knots. On land, seals find it difficult to move about quickly. This loss of agility on land is the cost of powerful movements in water. Dives usually last 5 – 15 minutes and from 30 – 70 metres. The nostrils are kept closed during dives and opened on surfacing. Only a very short recovery period is needed between dives. Seals exhale on diving and the lungs and alveoli collapse at a depth between 25 – 50 metres, thus pushing any residual air into non-absorptive air spaces. This prevents seals from suffering from buoyancy problems and any risk of the bends. The oxygen needed to sustain dives is stored in large quantities in the muscle (myoglobin) and in the blood (haemoglobin), which are present in higher concentrations in seals than in terrestrial mammals. These pigments’ affinity for oxygen is also higher than in terrestrial mammals. It is the ability to store large amounts of oxygen and rapid waste gas exchange that makes the seal so well adapted to the marine environment. On deeper dives, seals have the ability of shutting down the blood supply to non-essential organs and the heart-beat drops considerably to about 4 – 15 beats per minute. Seals have a relatively large blood volume (up to twice that of terrestrial mammals). Seal\’s muscles are able to handle the large amounts of lactic acid produced during the anaerobic metabolism of deep dives. All food is taken underwater. If the visibility is good, sight is primarily used, otherwise sound and vibrations, picked up by the sensitive whiskers are used. Their eyes are very well adapted for low light levels underwater. However, completely blind seals are able to live quiet happily for many years. We do not know whether seals use sonar for navigation. They do produce clicking noises which might be used for echo-location of food. Seals have well developed directional hearing underwater. The teeth bear a strong resemblance to those of a typical carnivore, e.g. dog or otter, in that they include incisors and well developed canines. An adaptation of the premolar and molar teeth is the presence of backward pointing cusps, used to hold onto such slippery prey as squid or octopus. The eyes are large with a strengthened cornea adapted to the refractive index of water, and a retina adapted to dim light conditions, allowing good visibility underwater. They also have a protective third eyelid that wipes sand away and a continually produced tear film also helps to protect the eyes. On land, in brightly lit conditions, constriction of the pupil reduces the light intensity, which in turn reduces the refraction of light through the lens, allowing the eye to effectively focus. 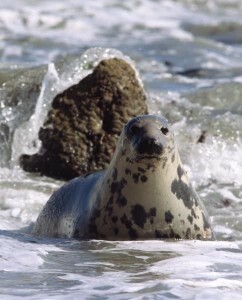 Seals restrict their seawater intake to avoid taking on excess salt. They primarily derive fluids from the food they consume, e.g. 90% of fresh water taken in by common seals is from the fish they eat and most of the remaining 10% is metabolic water and inspired water vapour. Seals kidneys are very efficient at concentrating urine. They produce a urine that has a higher concentration than seawater. Our seals have few natural enemies. Killer whales may take the odd seal in our waters. Man is the main predator and seals have been hunted for food for many centuries. 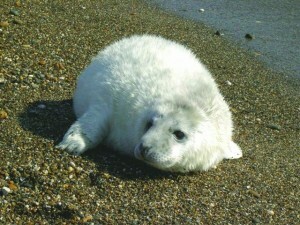 The commercial hunting for skins in the 18th Century left the population of Grey Seals in the British Isles at approx. 500 animals in 1914. This led to the 1914 Grey Seal Protection Act being introduced. A second Act in 1932 extended the close season. 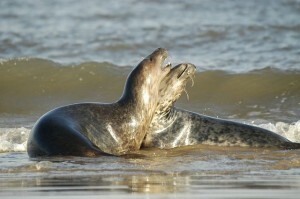 This deems the killing of Grey Seals illegal during the breeding season. 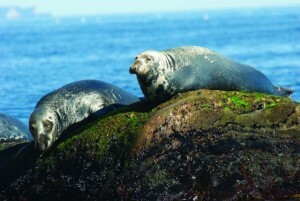 In 1970, the current Conservation of Seals Act was passed. This also covers the Common Seal. These Acts allowed the Grey Seal numbers to increase, but this increase has brought them into direct conflict with fishermen and seal culls were carried out in the 1960’s and 1970’s to reduce the population. These culls were ceased in 1978. Fishermen may still legally shoot seals caught in or near their nets.